It’s been a bit quite on this blog for a while. Followers of the MicroGnome may wonder what’s been happening. Those in the know have already realised that a lot has been going on at the home of the gnome. 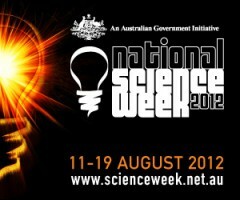 We can now pull back the curtains to reveal what we’ve been working on: our programme for National Science Week. Lab Without Walls, supported by PathWest Laboratory Medicine and the School of Pathology and Laboratory Medicine at UWA, is going on the road again. This time, without any holding back. LWW will be showcasing pathology methods used in recent fieldwork (MicroGnome: Around the Traps). If you live in the Kimberley, watch out for the LWW roadshow; Mozzie Mash and Mudpies. We’re going to show you what’s cooking in our kitchen. The plans are to demonstrate how we trap and analyse the mosquitoes that transmit virus infections like Murray Valley Encephalitis and Ross River infection. Local organisations will be taking part in a series of public science activities from Broome to Kununurra during National Science Week. We will also take a look at bacteria in soil, including that one with a dreadfully long name (Burkholderia pseudomallei) that causes a serious infection called melioidosis. Hence the mud pies. Watch this space for news of the Mozzie Mash & Mud Pies roadshow programme, and other Lab Without Walls activities this year. Peter Marshall has advised me of your visit to Kununurra. We have two upper classes (Year 5/6 & 6/7) that would benefit from your show. We already have a musician visiting the school on Friday August 17 so I cannot provide you with times for sessions yet. Do you envisage one session with the two classes (numbering about 54) or two separate sessions? How long do you need for the session? Do you work in the classrooms or do you need a larger venue and what equipment do you require? Please contact me as soon as you can so we can finalise the details. Thanks for the interest, Tony. We’re able to offer a range of activities to fit in with your educational needs from a show and tell to something a bit more hands-on. Peter has my contact details. Maybe we could do a bit of planning before the weekend. Tony, sorry to miss you all while we were in town. There is a radio interview (follow link on recent post) and there will be a TV doco in around two months. Meantime, you might like to consider getting involved in a Kimberley-wide schools science project to build, trap and identify mosquitoes during Science Week next year. If interested, please let me know. yesterday I was looking for the “Mozzie Mash & Mud Pies: Lab Without Walls Roadshow” at Kununurra but I couldn’t find the event. I’m an italian PhD (veterinary biotecnology) and I’m very interested in your work. If you are still in Kununurra, I would like to take a look to your mobile lab. Sorry to miss you. We were only in town (in the hospital grounds) for two hours, but we will be covered in the local newspaper next week and on TV later this year. Meantime, follow this blog to see more detail on the Lab Without Walls. If you’re in Perth at all, look us up at Sir Charls Gairdner Hospital.